What makes a smile beautiful? That's a complex question, but some qualities of a lovely smile are immediately identifiable: good tooth color, shape, and alignment are a few of the most important ones. If your teeth could use improvement in any of these categories, porcelain veneers could be just what you're looking for. Recent years have brought remarkable advances in dental porcelain technology. 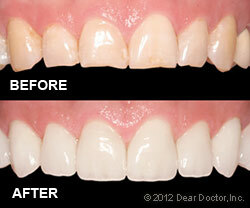 These days, veneers can be made so thin that they can sometimes be bonded directly onto your existing tooth surface. In other cases, a very thin layer of tooth enamel — as thin as the veneer itself — needs to be removed to fit the new porcelain surface and make it look as lifelike as possible. Either way, at TLC Family Dentistry the results you receive are sure to make you smile. Once we have agreed that veneers are the best choice for your smile, the first step in creating a new smile with porcelain veneers is to communicate exactly what you don't like about your smile as it is now. It's a great idea to bring in pictures of smiles you do like, as a starting point for discussion. It's possible to see how veneers would look on your teeth in one of the several ways. A model of your teeth can be created over which wax “veneers” can be placed; sometimes acrylic (plastic) or tooth-colored filling material can be placed directly onto your teeth to demonstrate the effect veneers would have on them. Once we have discussed all available options and decide that Veneers are indeed the best option for your smile, your teeth will be prepared by removing a small amount of enamel, if necessary. Molds of your teeth will be taken and used by a skilled dental laboratory to create your veneers, and you will receive a temporary set of veneers to wear during the few weeks it will take to create your permanent veneers. 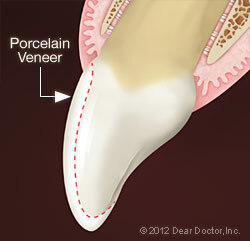 When the veneers come back from the lab, they will be cemented onto your teeth. Just like the teeth nature gave you, teeth restored with veneers need gentle brushing and flossing every day. This will remove dental plaque and ensure good gum tissue health around the veneers. Regular checkups at our office will remain as important as always to your oral and general health. And keep in mind that as tough as veneers are, they may not be able to withstand forces that come from using your teeth as tools (to open packages, for example) or biting into very hard foods like candy apples — which isn't good for your natural teeth, either! And if you grind or clench your teeth at night, you might be advised to get a custom-made night guard to protect your veneers — and your investment. At TLC Family Dentistry, our main goal is to leave our office with a smile on your face.